When I passed by this baby bok choy at the grocery store I suddenly had a thought of how they might taste if stuffed like cabbage rolls. They went into my cart and we were not disappointed. 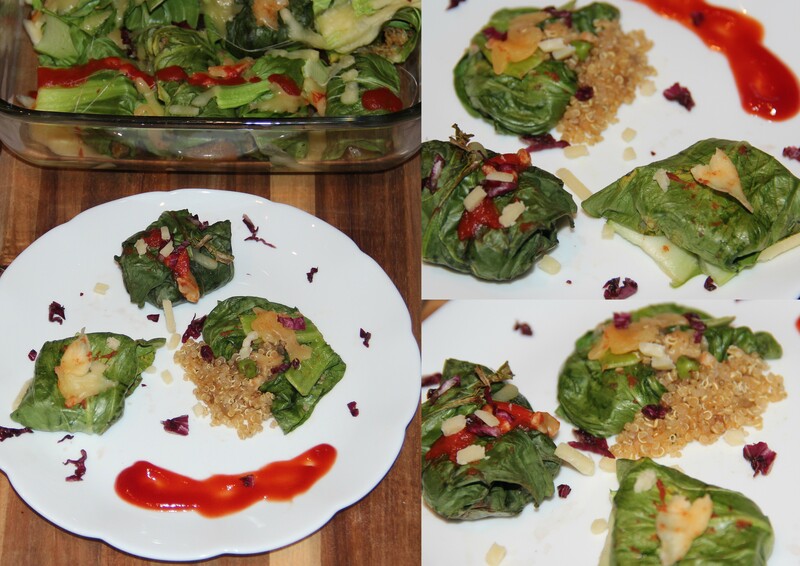 I used my Quinoa masala in Asian style stuffing here to make baked bok choy/pak choy wraps. These are super flavorful and there are endless variations you could use for the filling. Bok choy belongs to the cruciferous vegetable family, which also includes kale, broccoli, cauliflower, Brussels sprouts, cabbage, collard greens, rutabaga and turnips. These nutrition powerhouses supply loads of nutrients for little calories. After washing the large leaves from the bok choy, slice off the crunchy stem. Pre-heat the oven at 180deg. Grease the baking pan and set aside. Carefully remove leaves and lay on your work surface. Put a couple tablespoons of filling in the middle of the leaf and then carefully roll the leaf around the filling. Once the leaf wraps are place in dish, pour the chilli tomato sauce, sprinkle some cheese. Once baked sprinkle some pepper and seasoning as per taste and serve. I used homemade tomato chilli sauce to top the wraps, feel free to use super market one or just top with tomato puree. I baked only for 12 minutes as I wanted to retain crunchiness of the greens, so bake for more time if you like it to be soft and fully cooked. If the leaves are thin/ small feel free to use two leaves for 1 wrap. Bok choy can be substituted with spinach. Posted on December 15, 2014, in International, Salad/Wraps, Soups, Salad and Wraps and tagged Chitras healthy kitchen, drchdietfood, Qunia stuffed recipes. Super healthy meal ideas, Spinach wrapps. Bookmark the permalink. 9 Comments. brilliant! Love how people come up with things that work 🙂 Love your creativity.